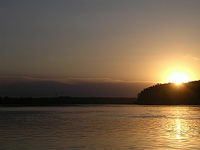 The Platte River is an approximately 310 mile (499 km) long river in the U.S. states of Nebraska, Colorado and Wyoming. Combined with the length of the North Platte, the river stretches 990 miles (1,593 km), with a drainage basin of some 86,000 square miles (222,739 km²), a large portion of the central Great Plains. It is a tributary of the Missouri River, which in turn is a tributary to the Mississippi River. 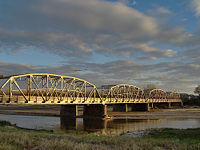 The Platte River played an important role in U.S. history, serving as a roadway west through the Nebraska plains, with both the Oregon and the Mormon Trails following the river's path during the era of westward expansion. Later the routes of the Pony Express and the Union Pacific Railroad followed the river's path. In the twentieth century, its valley was used for the route of the Lincoln Highway and later for Interstate 80, which parallels the Platte and the North Platte through most of Nebraska. In the middle of the Central Flyway (a primary North-South Corridor for migratory birds), the Platte hosts a multitude of migratory waterfowl, including the Sandhill Crane. Approximately 80 percent of the world's population of these cranes spend four to six weeks in the Platte Valley before returning north to their nesting grounds. However, human settlement has damaged this important ecosystem. 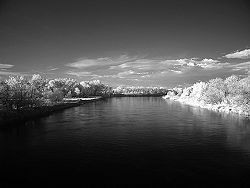 At the end of the twentieth century and beginning of the twenty-first, the Platte River is considered one of the most endangered waterways in the United States. Laws have been enacted on both federal and state levels that support the conservation of the Platte, and a number of organizations have been formed with the common goal of protecting, creating, and restoring bird, fish, and wildlife habitat. However, in the case of the Platte River, it has been noted that the abundance of organizations, all working separately, have reduced power and limited knowledge. Success will come on the basis of positive interaction and shared knowledge and resources among those with common goals. The Platte River is formed in western Nebraska east of the city of North Platte by the confluence of its two effluents, the South Platte and the North Platte rivers, both of which rise in the eastern Rockies near the Continental Divide. It flows in a large arc, southeast then northeast, across Nebraska south of the Sandhills region, passing the towns of Gothenburg, Cozad, Kearney, and Grand Island. It is joined by the Loup River five miles (eight km) southeast of Columbus and flows east past North Bend then to Fremont, then south, passing south of Omaha and joining the Missouri River five miles (eight km) north of Plattsmouth. Combined with the length of the North Platte, the Platte stretches 990 miles (1,593 km), with a drainage basin of some 90,000 square miles (233,099 km²). The Platte River has three main stretches from the Rocky Mountains to North Platte, Nebraska from there to Columbus, Nebraska and the onto the Missouri River. It starts from ice melt in the mountains and then follows down to the plains of Nebraska where it is used to irrigate farmland. The Platte is stabilized by reservoir storage of flood water and return flow by ground storage and many small tributaries along the entire length of the river. 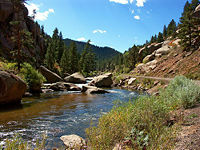 The Platte River is connected to many numbers of tributaries such as the North and South Platte Rivers which originate in the Rocky Mountains. From there it loses water on its way to the Missouri River - if it weren’t for its main tributaries, the Loup and Elkhorn Rivers, as well as the Salt Creek, the Platte River would run dry due to evaporation and irrigation. 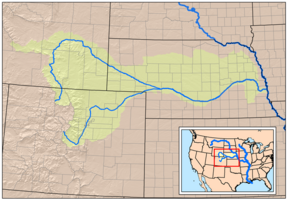 The Platte drains one of the most arid areas of the Great Plains and thus its flow is considerably lower than rivers of comparable length in North America. For much of its length, it is a classic wide and shallow braided stream. During pioneer days, the common humorous description was that the Platte was "a mile wide at the mouth, but only six inches deep." 49ers said it was "too thick to drink, too thin to plow." In western Nebraska, the banks and riverbed of the Platte provide a green oasis amid an otherwise semi-arid region of North America. 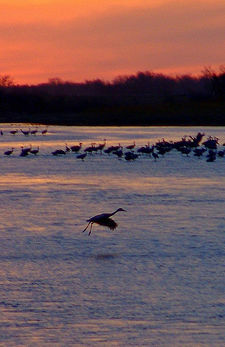 The central Platte River valley is an important stopover for migratory water birds, such as the Whooping Crane and Sandhill Crane, in their yearly traversal of the Central Flyway. The Platte River has shrunk significantly since the early-mid twentieth century. This reduction in size is attributed in part to irrigation, and to a much greater extent to the waters diverted and used by the growing population of Colorado, which has outstripped the ability of its groundwater to sustain them. More than a dozen dams regulate water flow along its path, decreasing its width. The Native American tribes that lived along the Platte River at the time of European exploration were the Oto and Pawnee. Living in semi-permanent towns with populations in the thousands, they planted crops along the Platte and its tributaries. Large hunting expeditions followed bison herds. The first European to discover the Platte was the French explorer Étienne de Veniard, sieur de Bourgmont in 1714, who named it the Nebraskier, an Oto word meaning "flat water." The French word for flat, platte, was later applied. The river provided valuable transportation for the French trade in furs with the Pawnee and Oto Indians. The Platte lay in a gray area between Spanish and French claims in the Great Plains. Joseph Naranjo, a black explorer, had also encountered the Platte, and later guided the Villasur expedition there to stop French expansion. Theirs was the deepest penetration of Spanish exploration into the central plains. Ceded to the United States in the Louisiana Purchase, the Platte was explored and mapped by Major Stephen H. Long in 1820. The Platte was used by American trappers, and the Great Platte River Road played an important role in westward expansion during the nineteenth century. It provided fresh water, game, and a clear path westward for the pioneers. Both the Oregon Trail and the Mormon Trail followed the Platte (and the North Platte). In the 1860s, the Platte and North Platte furnished the route of Pony Express and later for the Union Pacific portion of the first transcontinental railroad. In the 20th century, its valley was used for the route of the Lincoln Highway and later for Interstate 80, which parallels the Platte and the North Platte through most of Nebraska. This is also why many or most of Nebraska’s larger cities are located on or near the Platte River such as Omaha, Lincoln, Kearney, Grand Island, and North Platte. There were also historical sites along the Platte River such as Fort Kearny and other fur trading posts mostly due to the ease and abundance of traveling along the Platte River. In 1859 the first irrigation ditch was built to divert water from the Platte in order to be used in farming. Many reservoirs have been created along the Platte River used to supply water for farming irrigation such as Swanson Reservoir, Lake McConaughy, and Plum Creek Reservoir. Sandhill Cranes on the Platte River. These birds breed in the Northern U.S., Canada, Alaska, and Siberia. Each winter they undertake long southern journeys to wintering grounds in Florida, Texas, Utah, Mexico, and California. En route, more than 80 percent of these birds use migratory staging areas in a single 75-mile stretch along Nebraska's Platte River. Each spring nearly 500,000—largest known concentration of cranes in the world—of these birds spend four to six weeks in the Platte Valley before returning north to their nesting grounds. More than 86,000 square miles in Colorado, Nebraska, and Wyoming are drained by the Platte River and its tributaries. The Platte River ecosystem includes montane pine forest, native grasslands, and eastern deciduous forest. Nebraska is home to an incredible diversity of native wildlife species, including 346 birds, 83 mammals, 87 fish, 47 reptiles and 13 amphibians. Many of these live along the Platte River, in its valley and basin. Human settlement brought changes to the ecosystem. 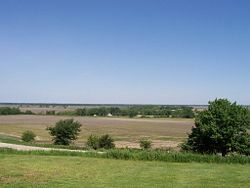 Wetlands were drained to create farmland and a vast amount of tall grass prairie was converted to monotypic crop fields. There was extensive irrigation and intensive river drainage, which played a part in changing the character of riverine habitats. While some organisms benefited from these changes, others suffered. The result is that at the end of the twentieth century and beginning of the twenty-first, the Platte River is considered to be one of the most endangered waterways in the United States, with concern building for years over the fate of its wildlife. The Platte River is in the middle of the Central Flyway, a primary North-South Corridor for migratory birds. 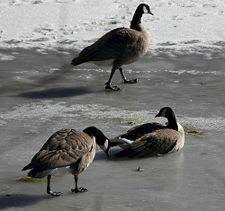 Millions of waterfowl pass through the region on their annual migration. Four of these have been classified as threatened or endangered species: the whooping crane, piping plover, interior least tern, and pallid sturgeon. 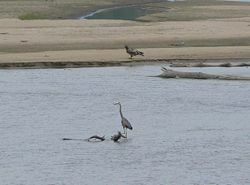 Over 400 bird species have been observed along the Platte River, and over 140 species are known to nest along the river. Both federal and state laws have been enacted to conserve fish, wildlife, and ecosystems, and protect the river system's biodiversity, and a number of organizations have been formed with the common goal of protecting, creating, and restoring fish and wildlife habitat. However, as noted by the U.S. Geological Survey, "In addition to the various water development practices that have altered historical flow dynamics of the Platte headwaters, future conservation is confounded by the large number of political authorities that conduct land management practices...The quality of connectivity that is fundamental to understanding riparian systems has been ignored in a fractionated approach to natural resource policy and management." Conservation Reserve Enhancement Program. This is a combined program of the U.S. Department of Agriculture, Farm Services Agency, and the State of Nebraska. It covers an area stretching approximately two miles on either side of the Republican and Platte Rivers, extending from the Wyoming border to central Nebraska and includes 100,000 acres of cropland near these two rivers and their tributaries. North Platte National Wildlife Refuge. This refuge in western Nebraska's panhandle is administered by the U.S. Fish and Wildlife Service, an agency of the Department of the Interior. It is used primarily as a resting and feeding area for waterfowl and shorebirds and, to a lesser extent, for waterfowl production. Wildlife species that use the Refuge include raccoon, striped skunk, black-tailed prairie dog, eastern cottontail, and mule and white-tail deer. Some of the fish species found in Refuge lakes include walleye, crappie, yellow perch, wiper, northern pike, white bass, catfish, and carp. Platte River Endangered Species Partnership. This program is the implementation aspect of the Platte River Cooperative Agreement, which was signed in 1997. Participants included the states of Colorado, Nebraska, and Wyoming, along with the U.S. Department of the Interior. The program's Governance Committee includes representatives from each state, the Bureau of Reclamation and Fish & Wildlife Service, the Nebraska Wildlife Federation, conservation organizations, and water users. This initiative has two main purposes: 1. To develop and implement a Platte River Recovery Implementation Program to maintain, improve and conserve habitat for four threatened and endangered species that use the Platte River in Nebraska: whooping crane, piping plover, interior least tern, and pallid sturgeon. 2. To enable existing and new water uses in the Platte River Basin to proceed without additional ESA requirements for the four target species. This program is focused upon the Central Platte River in Nebraska and would have only minor impacts on Colorado wildlife, including the formation of new wetland areas. Algis, Laukaitis J. 2006. Platte River odyssey: a University of Nebraska-Lincoln College of Journalism and Mass Communications in-depth report on the state of the Platte River. Lincoln, Neb: College of Journalism and Mass Communications, University of Nebraska-Lincoln. Burg, Max Post van der. 2005. Factors affecting songbird nest survival and brood parasitism in the rainwater basin region of Nebraska. Thesis (M.S. )—University of Nebraska—Lincoln, 2005. Condra, G. E. 1931. Development of the Platte River Bottomland in South Central Nebraska. "Annals of the Association of American Geographers 21" (1931): 101-105. Geology.com. Nebraska State Map Collection Retrieved July 14, 2008. Johnsen, Carolyn. 2006. Platte River odyssey: a University of Nebraska-Lincoln College of Journalism and Mass Communications in-depth report on the state of the Platte River. Lincoln, Neb: College of Journalism and Mass Communications, University of Nebraska-Lincoln. Kirsch, Eileen M. 1996. Habitat selection and productivity of least terns on the lower Platte River, Nebraska. Wildlife monographs, no. 132. Bethesda, MD: Wildlife Society. Kirsch, Eileen, et al. Colonial Waterbirds, Vol. 16, No. 2 (1993), pp. 139-148. Nebraska Department of Natural Resources. Legislative Bill 962 Retrieved July 14, 2008. Nebraska Studies. Europeans Compete for Trade Retrieved July 14, 2008. Nemec, Kristine. Underground Treasure Trove. UNL. Lincoln: CoJMC, 2006. Official Nebraska Government Website. Department of Natural Resources Retrieved July 14, 2008. Sidle, John G. and Craig A. Faanes. July 16, 1997. Platte River ecosystem resources and management, with emphasis on the Big Bend reach in Nebraska US Fish and Wildlife Service, Grand Island, Nebraska. Jamestown, ND: Northern Prairie Wildlife Research Center Online. Retrieved July 14, 2008. Bruce, B.W. and P.B. McMahon. 1998. Shallow ground-water quality of selected land-use/aquifer settings in the South Platte River Basin, Colorado and Nebraska, 1993-95 [U.S. Geological Survey Water-resources Investigations Report 97-4229]. Denver: U.S. Department of the Interior, U.S. Geological Survey. Condon, S.M. 2005. Geologic studies of the Platte River, south-central Nebraska and adjacent areas, geologic maps, subsurface study, and geologic history [U.S. Geological Survey Professional Paper 1706]. Reston, VA: U.S. Department of the Interior, U.S. Geological Survey. Dennehy, D.F. et al. 1998. Water quality in the South Platte River Basin, Colorado, Nebraska, and Wyoming, 1992-95 [U.S. Geological Survey Circular 1167]. Washington, D.C.: U.S. Department of the Interior, U.S. Geological Survey. Druliner, A.D., B.J. Esmoil, and J.M. Spears. 1999. Field screening of water quality, bottom sediment, and biota associated with irrigation drainage in the North Platte Project area, Nebraska and Wyoming, 1995 [U.S. Geological Survey Water-resources Investigations Report 98-4210]. Lincoln, NE: U.S. Department of the Interior, U.S. Geological Survey. Hardgree, M. 1995. A selected bibliography on the hydrology of the Platte River Basin in Nebraska through 1991 [U.S. Geological Survey Open-File Report 94-496]. Lincoln, NE: U.S. Department of the Interior, U.S. Geological Survey. Kimbrough, R.A. and D.W. Litke. 1998. Pesticides in surface water in agricultural and urban areas of the South Platte River Basin, from Denver, Colorado, to North Platte, Nebraska, 1993-94 [U.S. Geological Survey Water-resources Investigations Report 97-4230]. Denver: U.S. Department of the Interior, U.S. Geological Survey. Larson, L.R. 1985. Water quality of the North Platte River, east-central Wyoming [U.S. Geological Survey Water-resources Investigations Report 84-4172]. Cheyenne, WY: U.S. Department of the Interior, U.S. Geological Survey. Litke, D.W. 1996. Sources and loads of nutrients in the South Platte River, Colorado and Nebraska, 1994-95 [U.S. Geological Survey Water-resources Investigations Report 96-4029]. Denver: U.S. Department of the Interior, U.S. Geological Survey. Sprague, L.A. and A.I. Greve. 2003. Changes in nutrient and pesticide concentrations in urban and agricultural areas of the South Platte River Basin, Colorado, Wyoming, and Nebraska, 1994-2000 [U.S. Geological Survey Water-resources Investigations Report 02-4270]. Denver: U.S. Department of the Interior, U.S. Geological Survey. This page was last modified on 7 May 2015, at 16:32.